RTÉ has signed deals for RTÉ One's documentary series ‘1916’, narrated by Oscar nominated actor Liam Neeson, to major broadcasters in the UK, Australia, France, Spain and Denmark. The three-part series, produced and written by historian Briona Nic Dhiarmada and directed by Pat Collins and Ruan Magan, has also been licensed by 120 PBS stations in the US, as well as Aer Lingus. A COCO Television production, produced by Jackie Larkin and Executive Producers Linda Cullen and Stuart Switzer, the documentary has now been acquired by the BBC for BBC Four UK, SBS Australia, TF1 Histoire France, TVE Spain and DR Denmark. 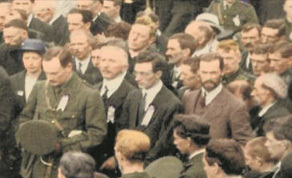 The series examines the 1916 East Rising in Dublin, which led to the establishment of an independent Irish state and, indirectly, the breakup of the British Empire. It also sets the Irish Rising in the context of the anti-colonial movement that followed the First World War, and explores the role played by the US and the Irish-American community at this seminal moment in world history. As a result, 1916 has been picked up by numerous PBS stations in cities with a high concentration of Irish-Americans, including Chicago, New York and Boston. Oscar-nominated Irish actor, Liam Neeson, who will be receiving the Outstanding Contribution to Cinema Award at next month’s IFTA Film & Drama Awards, said: "The series puts the Easter Rising in a broader, more international context than has ever been done, and shows how it inspired similar movements around the world. What attracted me most was that the series also focuses on the personal stories of those involved. These stories are very human and powerful." Edel Edwards, Head of RTÉ International Programme Sales said: "The demand for 1916, not just from the US and the UK but from around the world, underlines the global significance of the Easter Rising and its enduring legacy. As its centenary approaches, it's a timely moment to look back on the turbulent events that changed not only the relationship between Britain, Ireland and the US, but the world's relationship with colonial rule." ‘1916’ was created by Nic Dhairmada for the Keough-Naughton Institute of Irish Studies at the Univeristy of Notre Dame. Key Irish crew members include composer Patrick Cassidy, cinematographer Colm Hogan and editors Stephen O’Connell, Isobel Stephenson and Keith Walsh.